Learn to combine the power of an excellent web advertising platform with our advanced CPA network. Affiliates willing to scale up can opt to do so in various ways. Spending money is never hard, but investing wisely to achieve great returns on investment (ROI) and becoming a big whale is another story altogether. Some of the wealthiest, most experienced affiliates in our industry are in fact media buyers. If you’ve been wondering how to hit the major leagues, this is for you. Here’s a detailed, step-by-step guide on how to successfully start your media buying journey by combining Traffic Junky and CrakRevenue. As you’re going to invest money going forward, it’s really important to leave nothing to chance. Before even thinking about creating an account on Traffic Junky, be sure you have the basics covered. Which device do I want to target? Which language will you choose for your campaign? Which vertical are you going to promote and, more importantly, which offer(s)? For example, you could choose pay per lead (PPL) with Royal Cams if you were to focus on Russian and Eastern Europe GEOs. As such, you’d get up to $3.50 for each successful lead to the adult cam site which is a safe bet for any first attempt at media buying. Once your goals are set and you’ve chosen the right CrakRevenue offer for your desired campaign, now’s the perfect time to move on to the next step. Now that you’ve got a clearer picture of who you’re going to target and how, it’s time to set up your sales funnel. Basically, end users will first see your banners and, upon clicking on them, will be led to a landing page. Once logged in to your CrakRevenue account it’s easy to choose the creatives you want to use. On each offer page, scroll down to see most* available creatives: banners, HTML ads, pop codes, etc. Though for the sake of this guide, all you really need are banners (either animated or not). We’ve got plenty more creatives that don’t appear on the platform. Simply ask your Affiliate Manager for more or if you need something specific. As a quick example, we recently had an affiliate ask for banners and landing pages translated in Russian. Although they were not available in the dashboard, we had these believe it or not. The next step is actually creating your very first campaign on Traffic Junky. If you don’t already have an account, you’ll need to sign-up first. Once logged in, go to the campaign section and click New Campaign. The first thing you need to do is to set the basic settings of your campaign according to your campaign strategy. Start by choosing a name, then the device type, target group, and so on. Now that you’ve created a campaign, you want to limit any potential damage. Beware: this is where most media buyers fail! You simply cannot afford not to have a safety valve or two in place. Unless hemorrhaging money’s your preferred goal—there doesn’t have to be any hiccups along the way if you play things smart. Overspending on a campaign is no fun at all.. Although Traffic Junky has a clever algorithm in place that will lower your daily budget to match your funds, you ought to set a limit yourself. Define the timeframe of your campaign in the “Capping” section. Without start and end dates, your campaign will last indefinitely. Choose the days of the week and time-of day you want to display your ads. This way, you can optimize your campaigns according to your audience’s behavior. You can also serve ads indefinitely or for a set amount of time (i.e. X hours or days). Sets a limit to the number of times you ad is displayed to the same visitor in order to avoid overexposure and lowered clicks. Choose your banner size and upload your banners and landings to set the A/B test. Choose the Ad Zone (publishers) according to the banner size you’ve chosen. This is one of the trickiest parts about media buying. You want to be competitive amongst all existing bids on the Ad Zone you’ve chosen. This will set the volume and the share of traffic you’ll receive from the spot vs the competitors (all other bidders). On the other hand, don’t be too aggressive. Which is not to say you should be too passive, either. You need a fair volume to adequately A/B test your funnels, but still without spending your entire budget on one single campaign. A fair volume will allow you to have some good impressions and better chances to find something that will make you profitable. Keep in mind that most of the time, any given spot will have more than two bidders at once. It’s a cutthroat world out there! But competition is good, so fear not. 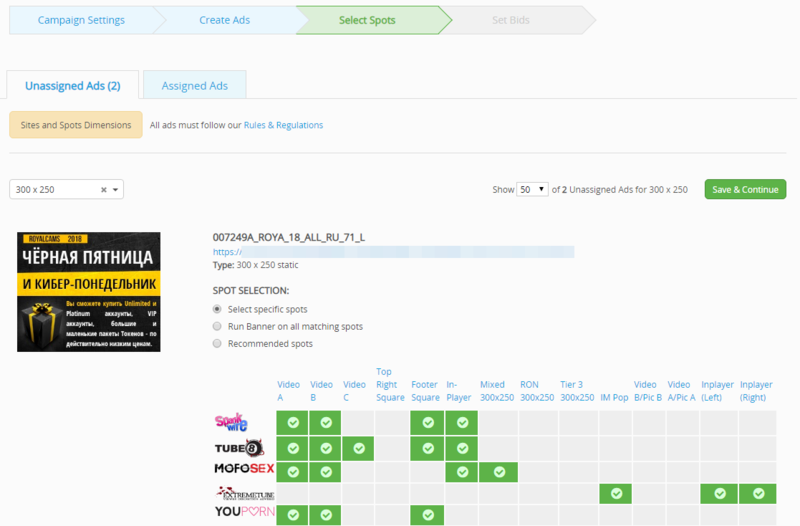 When you’re done filling in all the details, including targeting options, and after you’ve uploaded your banners, it’s time to submit your ad campaign. Once it’s been reviewed and approved, you’ll receive your first impressions and clicks. Step 9 : Check your stats and optimize! This is where the real media buying game begins. The bigger your budget and bid, the more you should watch your stats like an hawk. Based on the results you’ll be compiling with your A/B testing, you should be able to modify your campaign and adjust the weight of the different funnels you’ve tested. This step is crucial to the success of your campaigns, and the experience you’ll gain by doing it properly is what will help you become a professional media buyer in the end. Step 10 : Don’t give up! Don’t hesitate to try other campaigns. Usually, you’ll find your sweet spot—lucrative campaigns—after a while. Once you get the recipe right, that’s when you hit the volume button and really start making money. Until then, continue learning about media buying here by taking a look at these useful tips for new media buyers. Trust us, it’s worth it! Next article Affiliates: Take the December Challenge! Your mission should you choose to accept it: spy on your competitors and steal their best working ideas to perfect your own marketing campaigns! You’ve finally decided to give media buying your all. Before committing yourself, give these tips a read to stack all the odds in your favor.